Margaret Eleanor Atwood, OC is a prolific poet, novelist, literary critic, feminist and activist. She is a winner of the Booker Prize and Arthur C. Clarke Award, and has been a finalist for the Governor General's Award seven times, winning twice. Ms. Atwood is among the most-honored authors of fiction in recent history. Born in Ottawa, Ontario, in 1939, Ms. Atwood was second of three children of Carl Edmund Atwood, a zoologist, and Margaret Dorothy Killiam, a former dietician and nutritionist. Due to her father's ongoing research in forest entomology, Atwood spent much of her childhood in the backwoods of Northern Quebec and back and forth between Ottawa, Sault Ste. Marie and Toronto. She did not complete a full year of school until grade eight. She became a voracious reader of refined literature, Dell pocketbook mysteries, Grimm's Fairy Tales, Canadian animal stories, and comic books. She attended Leaside High School in Leaside, Toronto. 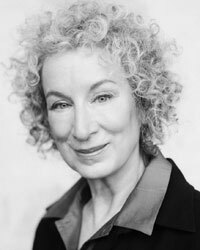 Ms. Atwood began writing at age sixteen and in 1957 began studying at Victoria University in the University of Toronto. Her professors included Jay Macpherson and Northrop Frye. In the fall of 1961, after winning the E.J. Pratt Medal for her privately-printed book of poems, Double Persephone, she began graduate studies at Harvard's Radcliffe College with a Woodrow Wilson fellowship. She obtained a master's degree (MA) from Radcliffe in 1962 and pursued further graduate studies at Harvard, for two two-year periods, but never took a degree. Atwood and her partner Graeme Gibson are members of the Green Party of Canada and strong supporters of GPC leader Elizabeth May, whom Atwood has referred to as fearless, honest, reliable and knowledgeable. Atwood has strong views on environmental issues, such as suggesting that petrol-powered leaf blowers and lawn mowers be banned, and has made her own home more energy efficient - including not having air-conditioning - by installing awnings and skylights that open. She and her husband also use a hybrid car when they are in the city. Margaret Atwood has written thematically diverse novels from a number of genres and traditions, including science fiction/speculative fiction, space opera and Southern Ontario Gothic. She is often described as a feminist writer, as issues of gender often (but not always) appear prominently in her work. Her work has focused on Canadian national identity, Canada's relations with the United States and Europe, human rights issues, environmental issues, the Canadian wilderness, the social myths of femininity, representations of women's bodies in art, women's social and economic exploitation, as well as women's relations with each other and with men. In her novel Oryx and Crake and in recent essays, she has demonstrated great interest in (and wariness of) unchecked biotechnology. Ms. Atwood's first collection of poetry was Double Persephone (1961). The Circle Game (1964), her second, won the Governor General's award for poetry. Of Atwood's poetry collections, the most well-known is perhaps The Journals of Susanna Moodie (1970), in which Atwood writes poems from the viewpoint of Susanna Moodie, a historical nineteenth-century Canadian pioneer on the frontier. As a literary critic, she is best known as author of the seminal Survival: A Thematic Guide to Canadian Literature (1972), which is credited with sparking renewed interest in Canadian literature in the 1970s. She also wrote several television scripts, including The Servant Girl (1974) and Days of the Rebels: 1815-1840 (1977). Atwood has been vice-chairman of the Writers' Union of Canada and president of International PEN (1984-1986), an international group committed to promoting freedom of expression and freeing writers who are political prisoners. Elected a Senior Fellow of Massey College at the University of Toronto, she has sixteen honorary degrees, including a doctorate from Victoria College (1987), and was inducted into Canada's Walk of Fame in 2001. Her literary papers are housed at the University of Toronto's Thomas Fisher Rare Book Library. She was awarded the Humanist of the Year award from the American Humanist Association in 1987. Among her more notable acts of activism, Atwood donated all of her Booker Prize money to environmental causes and gave up her house in France after Jacques Chirac resumed nuclear testing. An active member of Amnesty International, Atwood once promised a free subscription to its bimonthly reports to the next person who accused her of being too pessimistic. Ms. Atwood invented the "LongPen" billed as "the world's first long distance signing device."